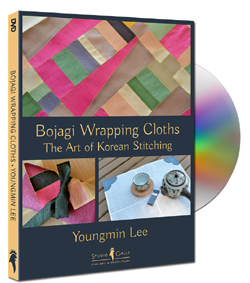 My newly finished 2-hour DVD, "Bojagi, Wrapping Cloths: The Art of Korean Stitching" explores traditional and contemporary Korean textile art form. Three Bojagi projects: Gift Wrap Bojagi (Yemulbo), Covering Bojagi (Sangbo) (cover photos) and Patchwork Bojagi (Jogakbo) are presented demonstrating the basic stitches, fabrics, and techniques needed to make your own beautiful Bojagi. 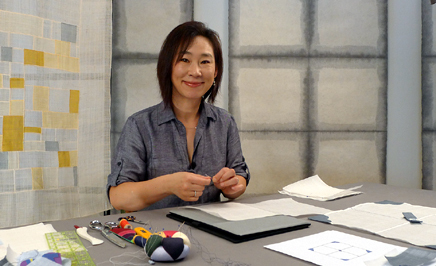 Bojagi are perhaps the most unique form of Korean textile art. They were used to wrap, carry or store things ranging from precious objects to everyday clothes and common household goods, and were also used to cover foods. Koreans believed that by wrapping an object, ‘bok’ (good fortune) could be enclosed within a bojagi. Many surviving bojagi are from the Joseon dynasty (1392-1910). Various kinds of fabric were used in bojagi, including silk, cotton, hemp, and ramie. Jogakbo, patchwork bojagi, were made from scraps and remnants of fabrics. Beautifully constructed jogakbo were the result of frugal, practical fabric recycling. Bojagi can be described as a true form of abstract expressionism created by Korean women. To get more information about the bojagi, please click links in the right pane. Items are shipped by USPS. If you want the express delivery, please contact me. I ship from Monday to Friday. Orders placed during weekend will be shipped on the next Monday. You may input the quantity in next step. Choose "Don't Have Paypal Account?" option to pay with your card in next step.